The Stratocast™ mobile app can receive push notifications to notifiy you when a camera detects motion. To help you troubleshoot push notification issues, learn about the possible causes and solutions. Description of cause: Inaccurate motion detected event notifications received. This Stratocast™ mobile app sends this push notification when the camera detects motion. If motion detected events occur close to each other, a push notification is only sent for the first occurrence. If you receive this push notification and you think that your camera is detecting motion incorrectly, contact your service provider. 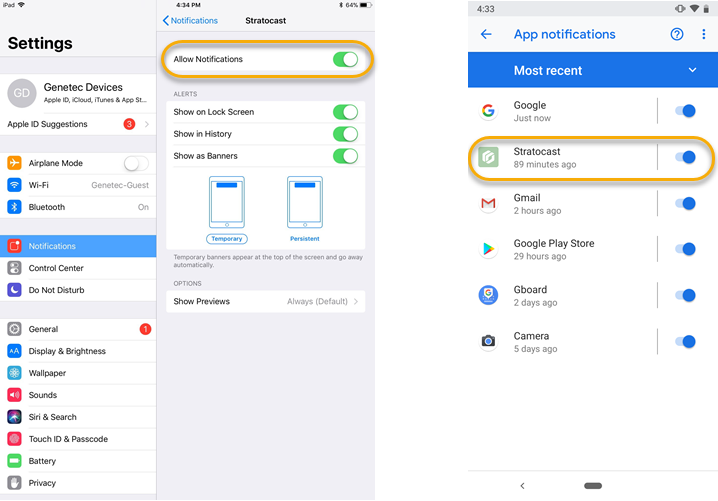 If you keep receiving false or inaccurate motion detected push notifications, you can modify the push notifications configuration settings in the Stratocast™ mobile app. TIP: Do not log off the Stratocast™ mobile app to ensure that you keep receiving notifications. Description of cause: iOS or Android settings for notifications are not enabled for the Stratocast™ mobile app. Solution: Make sure that the iOS or Android settings for notifications are enabled for the Stratocast™ mobile app. Description of cause: Unable to receive push notifications due to firewall configuration issues. Solution: Check your firewall settings are configured correctly.